I just finished reading my first full work of philosophy: On the Genealogy of Morality by Friedrich Nietzsche from a to z.
I noticed Nietzsche’s liberal use of italic type, almost as if the text was meant for oration. The above dictum echoes Marquis de Sade’s “cruelty, very far from being a vice, is the first sentiment Nature injects in us all,” both Sade and Nietzsche speaking of innate cruelty. 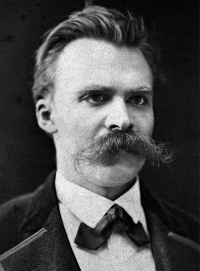 However, Nietzsche never read Sade. Nietzsche’s writing is so appealing and so strong that form and content are indissoluble. I can’t imagine what his philosophy would have been like if he had been a bad writer. Only minor point, towards the end, I got the impression that Nietzsche himself was the resentment-man. This entry was posted in Uncategorized and tagged form and content, innate cruelty, Marquis de Sade, Nietzsche, philosophy, resentment on December 27, 2013 by jahsonic.